In the December of 1980, four men from Czechoslovakia became heroes in their homeland by defeating Italy 4-1 in the Davis Cup final in Prague. Thirty-two years later on the same venue, this time as an independent nation, the Czech Republic found themselves in similar territory. Their opposition was the very formidable Spanish armada, whom they had already lost to in the 2009 final. In the 100th edition of this prestigious competition, the Czechs were looking to complete a rare Davis Cup-Fed Cup double, after their women’s team beat Serbia at the same Prague venue two weeks ago. Despite the absence of their favorite son, Nadal, the Spaniards had a strong line-up led by the in form Ferrer and the newly crowned Barclays ATP World Tour Finals doubles champions, Marcel Granollers and Marc Lopez. As for the Czechs, they were relying heavily on their two big guns, Berdych and Stepanek. The indoor O2 Arena in Prague, with its fast-paced hard court, was tailor-made for the big serving Czechs, who were going all out to neutralize the Spanish force. Heading into the weekend’s fixture, Berdych gave his Spanish counterpart Almagro a mouthful, terming him as the weak link in the Spanish team. These pre-match statements added extra spice to an already mouthwatering finale. On the opening day, Ferrer was drawn to take on Stepanek, while Berdych was to lock horns with Almagro. Ferrer got the Spaniards off to a perfect start, after a clinical performance against the aging Stepanek. The world number 5 overcame a hostile crowd and a shaky start, to stay on top of his opponent, before running away with a straight sets victory 6-3,6-4,6-4. The first point went to Spain and all the pressure was on Berdych to perform. Berdych and Almagro had already faced each other five times this year, with the Czech winning four of those encounters. In the first set, Berdych needed just one break point to take a 1 set to love lead. Finally, the home fans had something to cheer about. 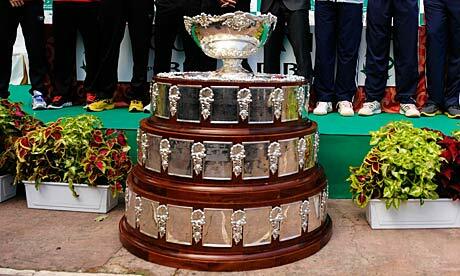 But the drama, so typical of Davis Cup matches, was yet to unfold. The talented Spaniard fought back in the second to level the match and silenced the crowds. We were in for a battle and the fans inside the O2 Arena could sense it. Following a series of controversial calls by the umpire and some big serving by Berdych, the Czechs went in the ascendancy again, winning the 3rd set 6-3. And just when it looked like Berdych had steadied the boat, a patch of tentative play on his part brought Almagro right back in the match, taking us in to a decider. The Czech number 1 had to find his best tennis to fend off the Spanish challenge, taking the final set 6-3. After almost 4 hours of high drama, the hosts were able to level the tie on day one. It came down to the doubles and the Czechs were leaving nothing for chance. With the Spanish pair of Granollers and Lopez brimming with confidence after their victory in London, the hosts were forced to bring out their A-team of Berdych and Stepanek. The Spanish duo took the first set of the pivotal doubles rubber, but the Czechs displaying their sheer ability and big match temperament, prevailed in four sets in three hours and 19 minutes. Taking full advantage of a weak Lopez serve, the Czech pair gave their team a 2-1 advantage, just one win away from the crown. Spirits were high in the Czech camp ahead of the last day’s play, but the Spaniards had the fresher legs. Ferrer outsmarted Berdych 6-2,6-3,7-5 in the first reverse singles to keep Spain alive in the Davis Cup final. Berdych denied all claims of his bad physical state after a grueling first 2 days, and admitted that his opponent was simply ‘too good’. Into the fifth live rubber and the hopes of their respective nations rested on the shoulders of Almagro and Stepanek. The wily veteran, playing in his third best of five-set match in three days, rose to the occasion and outwitted his Spanish opponent in four well-contested sets. He defied his 33 years to provide a fairytale finish to the 100th final. It was a first title for the Czech Republic as an independent nation. And fittingly, it was all done in front of a watery-eyed team of Ivan Lendl, Tomas Smid, Jan Kodes and Pavel Slozil, who were part of the winning Czechoslovakia team back in 1980. In truly one of the most dramatic ends to the year, Czech Republic dethroned Spain to go down in the history books as the only nation to win the Hopman Cup, Fed Cup and Davis Cup in one calendar year. Thus the Czechs have really cashed in on their impressive mix of skill and fighting spirit.